“I don’t want to say it but…it was a fluke. It was,” Burrell tells UFC.com. Spang got Burrell out of the cage quickly in the first round with strikes and “The Rock-N-Rolla” was none too happy about it. Adding to his frustration was having to wait a long time for his opportunity to redeem himself with another fight. Strikeforce was on its way to being folded and began having fewer events, and fewer opportunities for contracted fighters like Burrell to do what they love to do and pay their bills. The financial stresses and self-doubt began to creep in to the Philadelphia fighter’s mind. “I knew I was good, but the more time that passes and you don’t fight, you start second guessing yourself. ‘Dang, I might not be that good,’” he reveals. “[Financially] It was hard. It was rough. But I have good management and they helped me out. I have a good team and they all made sure I was taken care of,” he continues. They also made sure to encourage Burrell to do his due diligence and continue to train, even as it seemed like he would never get another fight. Month after month dragged by without a fight for him but he still got up each morning and made sure he’d be ready in case he got the call. Eventually, Strikeforce had its doors shuttered completely and it was announced that some of their fighters would be making a transition over to the big leagues – the UFC. Burrell waited and worked. Coming off of a loss, he knew he didn’t have the best shot at being picked up by the promotion, despite having an excellent overall professional record. “I hadn’t gotten the call yet and I contemplated giving it up,” Burrell admits. Working involved lots of water, running, salad and grilled chicken on a meager diet of no more than a thousand calories a day for Burrell. He knew that if he were to get the call up from the UFC, it would probably be to fight on short notice, so he wanted to keep his weight in check and his skills sharp. In addition to this strict diet, he was doing MMA sparring every day and boxing sparring with future boxing hall of famer Bernard Hopkins. According to Burrell, word had spread about him being a quality fighter with a unique, pressuring style, and Hopkins’ people began bringing “The Executioner” in to work with the MMA welterweight. All the hunger pangs, punches and sweat ended up not being in vain, as Burrell got the call he was dreaming of, the one that would keep him in the sport. He remembers the moment vividly. “I was on a crowded train and one of my co-managers, Brian Gillespie, called me and asked, ‘how much do you weigh?’ the 23-year-old recounts. Even now, he smiles as he remembers the moment. He was set to fight fellow former Strikeforce fighter Yuri Villefort at UFC 157 on February 23rd. There wouldn’t be many more smiles for about another week, however, as he struggled to make weight on short notice. Burrell says that he had not been drinking enough water all along to cut the weight he needed to make the welterweight limit. He tried and tried all through fight week but a couple hours before the Friday weigh ins, “I was in the gym and my body stopped sweating. It wasn’t sweating at all. I was like, ‘Oh my God.’ When I realized this, I did a couple more sessions in the sauna. I did a steam sauna, a dry sauna and jumped in the whirlpool. Still, my body wasn’t dropping any more water weight. He was told to drink two gallons a day but could only stomach a gallon. Burrell got to the scale at the UFC 157 weigh ins knowing he’d be heavy, but he still didn’t feel extra pressure. “My whole thing was, ‘if they let me fight, he can’t beat me,” he says. Coming off of a loss and then failing to make weight might add to the stress of a UFC debut but Burrell says that he felt confident that if his opponent accepted the fight despite his being over the weight limit, he’d get the job done. “I had heard him say that he was more explosive than me and better everywhere than me. I knew that was a lie. It wasn’t my best day but he still couldn’t beat me. So, at the weigh ins I was just thinking, ‘please take the fight,’” he said. 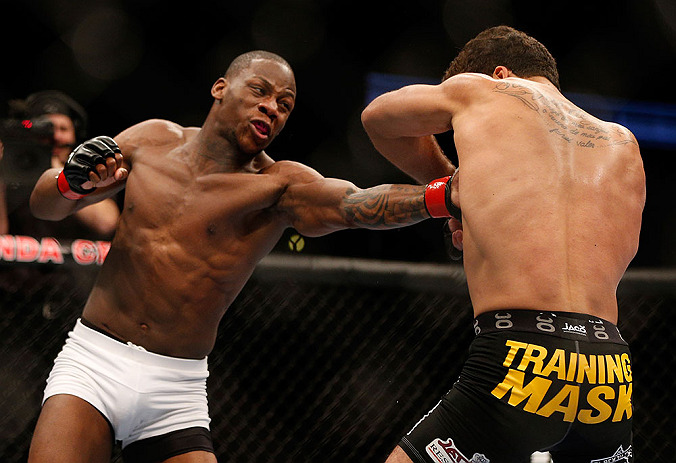 Villefort took the fight and Burrell proved himself right in earning a unanimous decision win. After his roller-coaster year, the UFC debutant felt only relief as his hand was raised in the Octagon for the first time. Now, he looks towards the future with a renewed hunger and motivation to succeed as a professional fighter. He’s gone through too much to get complacent and self-satisfied.